"This is a recipe I learned in kindergarten, and it's great to do with your kids or make for a Halloween or an ocean-themed birthday party." With a sharp knife, cut the hot dogs in half the short way. Slice each piece in half vertically, cutting about 3/4 of the way up towards the rounded end. Leave about 1 inch of the rounded end as the head of the octopus. Rotate the dog 90 degrees, and make another vertical cut. Cut the 4 legs in half again, to make 8 legs and a head. The hot dogs should look like tassels with rounded heads. Bring the chicken broth and chives to a boil in a soup pot. 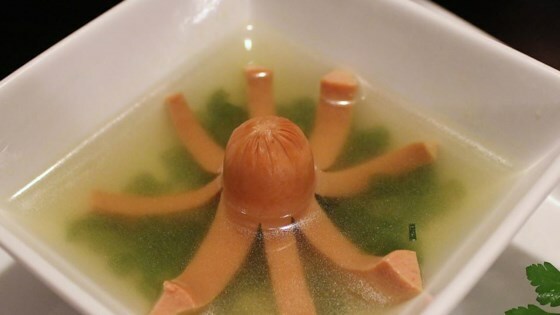 Place the octopus hot dogs into the boiling soup, and simmer for about 5 minutes. The legs will curl to make the octopus shape. Serve in bowls with an octopus or 2 in each bowl. Not the greatest, my picky little eater refused to finish his. My kids love this! I just boiled the hot dog octopi in plain water & served on plates with ketchup. The kids loved pulling apart the legs & dipping them one at a time. So fun. I just use packaged chicken noodle soup and put the sliced hotdogs in. The kids are crazy about it. This is great! i boil them plain and serve them in my kids' bento boxes for lunch. they love 'em. This is really good put on top a bowl of mac and cheese with some fish crackers sprinkled on top. These are great! A new lunch favorite! Thanks for the terrific idea. I actually added the hotdogs to matzo ball soup and served it for Halloween dinner. Family loved it!